Issue eleven has 132 pages packed with top quality photos from Poland, the Czech Republic, Slovakia, Serbia, Romania, Belarus, Ukraine and Russia. I’ve seen some interesting styles in Poland and there’s plenty to see over there which is well portrayed by this magazine with a range of trains from all over the country. There is an interview with FYGS crew from Belgrade. Alongside a few pictures of their work they discuss the scene in the Balkans, their hunt for clean trains, the plod and ganja. Elsewhere there is a short report of a trip to Stepnogorsk in Kazakhstan. 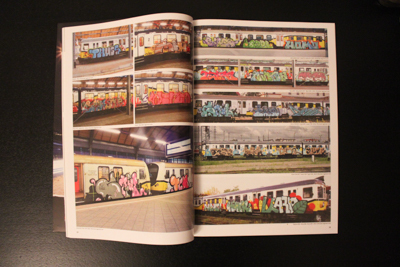 Concrete often features ‘first hits’ on various systems and new stock, such as the Polish high speed train on page 55 or the Monterrey Metro on 13, likewise Stepnogorsk is new to graffiti. Stepnogorsk is cold, the trains have net curtains and a blue and yellow livery that looks as if it’s been painted on with a brush. The report has the endearing mark of a graffiti anorak which gives me the idea that had the author been born in the 50’s he’d have been a trainspotter. 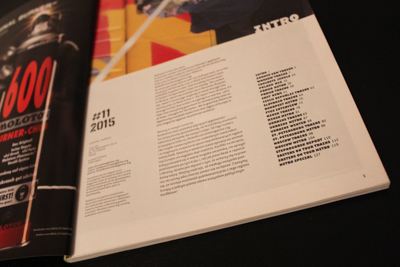 The most interesting section of the issue for me is the account written by Neak on the situation in Ukraine. He writes about the involvement of Ukrainian writers in Maidan and the atmosphere of revolution in which graffiti could be freely done. There is a fantastic picture of the ‘Revolution 2014’ piece that was painted just off Maidan square. The piece highlights the power that graffiti can have in expressing popular sentiment as it has done elsewhere in Syria for instance. The author says that, as well as decorating the revolution, writers have been in the thick of the action and some are now fighting in the east of the country. In a similar way to the football fans at Barcelona or Lechia Gdansk who resisted their respective country’s regimes, the Egyptian Ultras who fought in the Arab Spring, or indeed the Ukrainian Ultras, graffiti writers are also part of a well organised underground movement that often faces police repression against it’s activities. So when there is large scale resistance to the state it’s quite likely that groups like these will get involved in it. Finally there are a few pages of street damage, news on upcoming releases, and an ‘easters on tour’ section at the back which showcases pieces from around the globe. 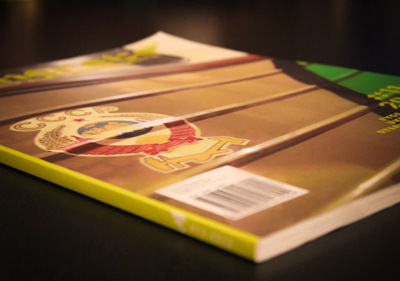 All in all this is a well produced magazine containing good quality content. The Stive and Pankow/Godhay pieces particularly stood out, alongside the nice shots at the top of page 105 & 83, and the Santa Claus photo on page 91. I always try and spot the Anarchist symbol in graffiti magazines which in this one I found on page 30! Hey! Thanks for the pingback! Cool site.